BUCValuPro is very simple to use with our sophisticated searching alogorithms. Enter your boat, yacht or watercraft specifications and click submit. 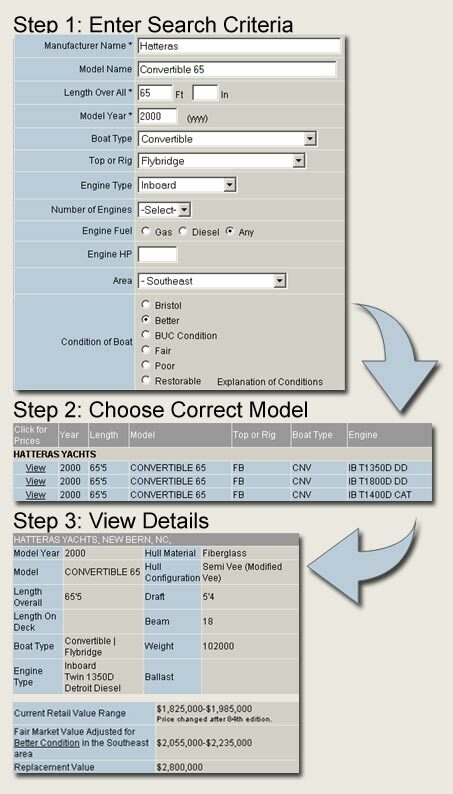 The BUCValuPro search engine will find the closest boat,yacht or watercraft matching your specified data. From the results list, click View for the boat you want to see pricing for. You can also add outboard engines and trailer options. The Details page will automatically make adjustments to the retail price range based on the area and condition you specified. It will also show boat replacement values.